Jim competed in Formula One from 1960 to 1963, participating in 12 World Championship Grands Prix and numerous non-Championship races. However his place in motorsport history came as the owner and driving force behind Chaparral Cars of Midland, Texas. During the 1960s in the United States Road Racing Championship, and later in the CanAm, his Chaparrals were the most innovative cars in racing. He was a very early adopter of aerodynamics applied to race cars and was leading proponent of that technology for an entire decade. Jim returned to prominence as a team owner in CART Champcar racing – scoring two wins in the Indianapolis 500 (1978 and 1980. Hall was honored by the RRDC at the 2012 Long Beach GP with “An Evening with Jim Hall Presented by Firestone”. 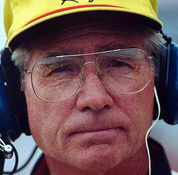 He is a member of both the International Motorsports Hall of Fame and the Motorsports Hall of Fame of America.